Today I’m delighted to bring you a post by Sarvi who is one of our moderators over in the discussion forums. She’s been working on a two part series giving advice on photography. 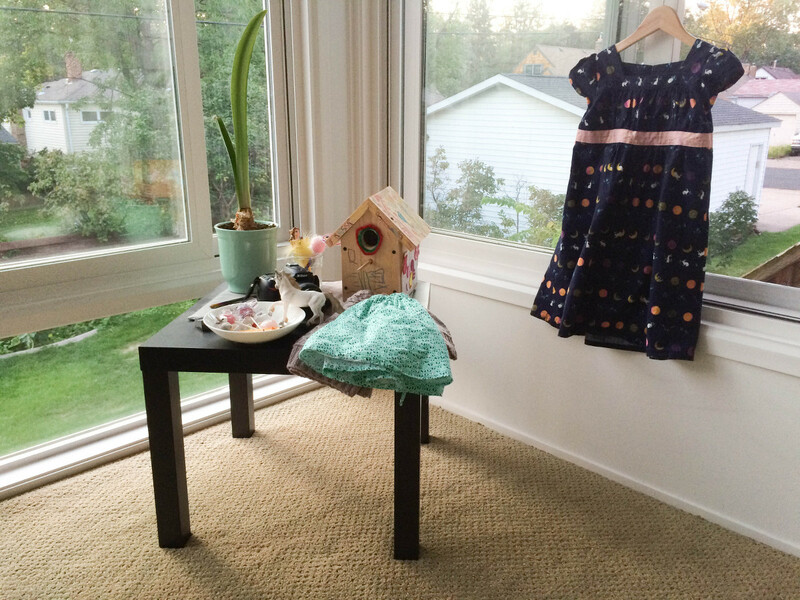 The whole idea for the series came from the fact that you all work hard on your sewing and it is fun to share your finished projects with the online sewing community. The first in Sarvi’s photography series touched on finding the best location to take photos of your Oliver + S sewn garments. 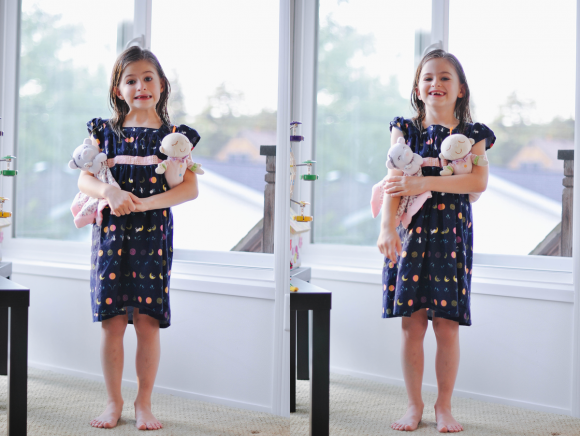 She’s back this time with some photography tips to help you work with child models. Here she is. Enjoy! Here is the list that I put together of my top four photography tips for working with children. You knew this was going to be the first thing on the list, right? A major key to doing anything with children is working around their limited patience and interest in holding still to be photographed. 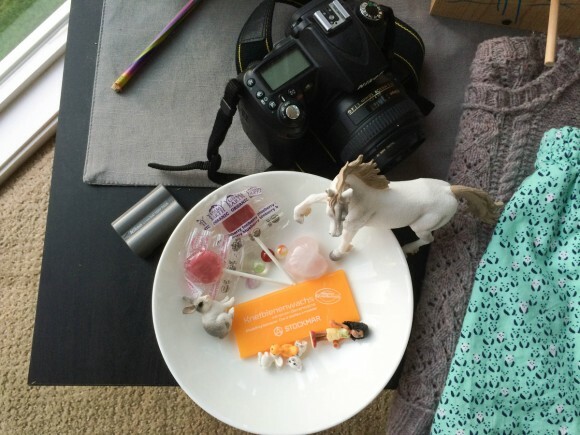 So figure out all the boring stuff first: Do I have a memory card/film in the camera? Are all the clothes pressed and ready? Are any props close at hand? (They should be; kids love props and can play with anything.) Only then should you get the child involved because nothing looks more wilted than a kid who was having fun ten minutes ago. Sometimes fake smiles are really cute! You can still ask your child to smile sometimes when you want to capture her ultra cheesy fake smile. It’s sweet and funny. But the best way to get a genuine smile is to say or do something worth smiling at, like making a ridiculous face, making up a little story about them, or telling them a joke. You’re not shooting video right now, right? This is the time to bust out the random noises or whatever it is that gets a grin out of your particular kid. Don’t worry if you can’t get the million dollar smile you know is in there; kids have such gorgeous, expressive faces they don’t have to look giggly to look wonderful. How about playing “I spy” and asking them to look for a particular object you’ve hidden somewhere, or to point out something that’s in the direction you want them to look? If nothing else works, most kids are brilliant mimics and will be only too happy to imitate you, especially if you do something slightly undignified. Shoot fast, and shoot a lot! You don’t have to keep everything, so feel free to keep clicking away while you’re talking. You can always dump the ones you don’t need. A lot of great moments come when you’re not meaning to shoot, so keep your finger on the shutter and fire away. Don’t forget that there’s another way to exploit the camera, too: kids love gadgets. Let them peek at the shots you’re getting and sometimes they come up with genuinely great ideas of their own. If you really want to show the stitching, you can photograph the clothes by themselves. Pictures of modeled clothes are just as much about the child as the garment. The stuff you’ve been hoarding? The crackers, the lollipops, the stickers and stamps? The special trinket on a high shelf? The good ole cash and coin? Ask yourself how badly you want this portrait of your child and pay accordingly. 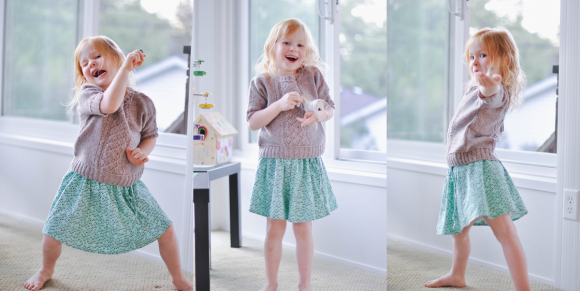 I hope one or two of these tips will give you some ideas for making being photographed fun for your kid, because I think that really comes across in photos. Any questions, add them in the comments and I’ll see if I can help find an answer! I love this, Sarvi! Especially the “don’t say smile” tip. So, so true! “Ask yourself how badly you want this portrait of your child and pay accordingly.” hahahahah LOVE IT! Usually they laugh and hug and I get a great one of the two of them then. Pretend you love each other, perfect! Sarvi is brilliant, what a great post. 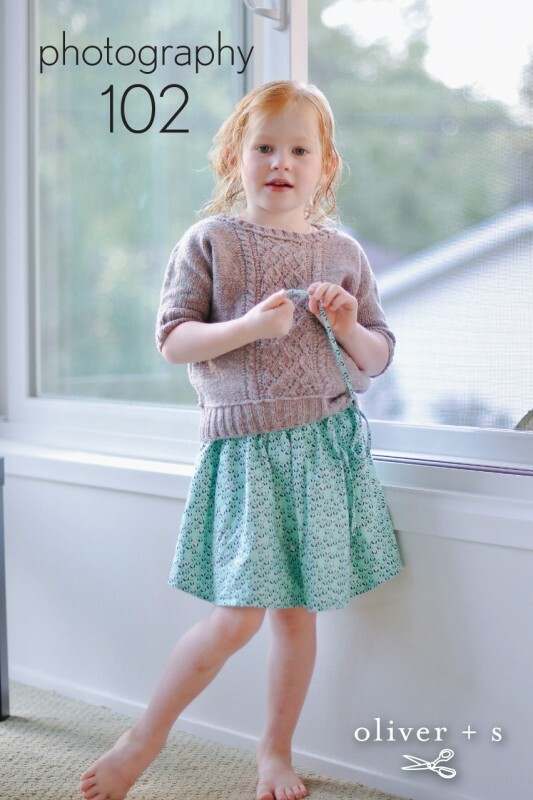 I owe a huge thank you to Rebecca whose adorable, playful daughters made these tips come to life. 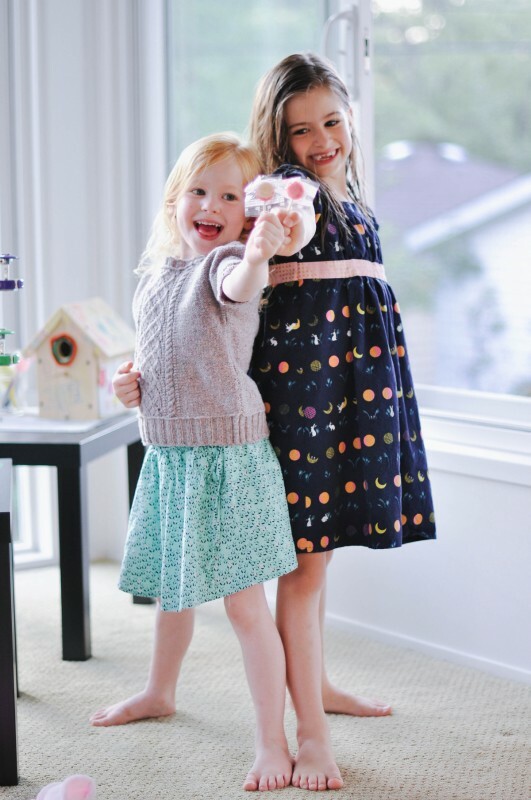 Please note that their clothes are both sewn AND knitted by their extremely talented mama, who’s a terrific photographer to boot. Great tip! I can’t tell you how many times this has happened….outfit done; kid reasonably clean; hair done; threads clipped, golden hour calculator checked…..then, I grab the camera…..and the battery is dead!! LOL happens to me all the time. I could suggest getting an extra battery or 2 and keep them charged. You can generally get them pretty cheap on Amazon and sometimes 2 for 1 with extra charger port for 10-20.00 a great investment. Great advice. My granddaughter charges 😉 pay accordingly is right. She’ll get cash, her own outfit, trip to the beach or springs or just extra money on her lunch card for snacks at school. BUT SHE GETS PAID her words. She is now 12. Its been getting very difficult to get her to smile AT ALL since 11. She now wants to get into modeling. I scoff…….umm you’ll need to show those pearly whites LOLOL. Now she wants to model for me for practice. SCORE my 9m old granddaughter never stops smiling……until you want her too so this advice will be better suited for the baby. Can’t wait to try it out.